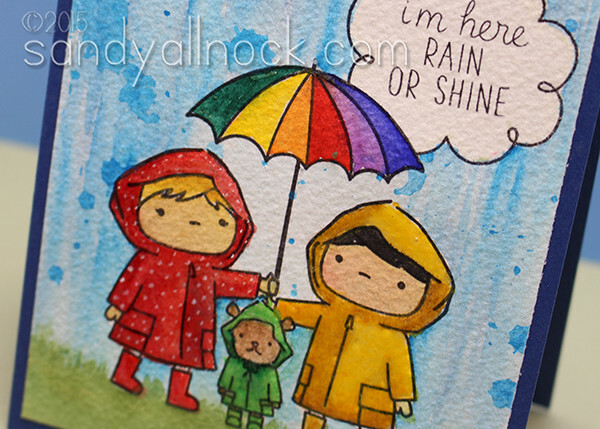 Sometimes painting rain is a bit more necessary than painting sun – and with this darling stamp set from Mama Elephant, a rainy sky was a must! My little friend Penny (you may remember when she taught me to paint HERE) came to help me out with her new watercolor technique. She’s the CUTEST! Just this weekend we had a *wee* bit of rain. I live in Washington, how crazy is it that we haven’t had any in months? !I did learn a new word that you might want to know: petrichor. It’s that lovely after-rain smell…..I want MORE PETRICHOR! But maybe just shooting this video inspired Mother Nature to send a couple drops our way. It didn’t last long, but I’m hopeful! Maybe if we click the “like” button enough on this video, she’ll return!? Watch it below, or click HERE to see it in HD on YouTube! Even though my attempt at Penny’s technique was a fail, I still love the splotchy dots it gave me! And I was really glad I got the stamps all covered up with masking before then, or I might have had quite the mess on my hands! I think the classes are almost all filled up – there were only one or two seats left when I talked with Stamp Fever in Orange last week, but if you want to check, feel free to call the store to see! (714) 974-3552 Excited to see you guys on the weekend! I’m finding it hard to navigate your blog. This format means that we have to go “home” to click on the next post… frustrating. It must be a way to get your page views increased or something related to revenue? Yours is not the only one that has made this switch recently. I know, really – it frustrates the heck out of me. I have web guys hired to start a redesign and I can’t WAIT!! Very cute and I like Penny’s technique. I love that! I’m going to see if I have the right size googlie eyes! I love it when you showcase a stamp set I already own! Thanks Sandy!